When a grower asks two specialists the same question, they can receive skewed (or even contradictory) answers. In this case, however, we were all on the same wave length. The following exchange took place between an Ontario grower with a nozzle/weed question and Jason Deveau (nozzles) and Mike Cowbrough (weeds). Grower: Can you please help me? I have been spraying fomesafen (trade name Reflex) in soybean with an AI 11005 nozzle at 20 gallons per acre for years. However, for the last two years we have not been getting ragweed control. We get a quick burn, but then the ragweed regrows. The agrichemical company recommended going back to a TeeJet XR flat fan nozzle to give “excellent coverage for a contract herbicide”. 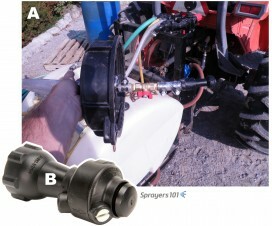 Is there a nozzle choice that gives coverage but better drift control than an XR nozzle? 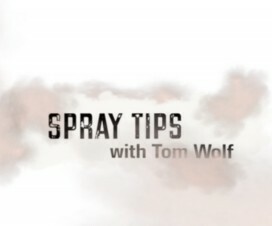 Nozzle Specialist: PLEASE don’t use an XR nozzle for herbicide applications. Unless you’re using a 06 (grey), XR’s create a Fine or Very Fine spray quality, which is irresponsible for any herbicide. Drift is not my only concern with an XR; Small droplets are so easily influenced by temperature and wind that you’d be surprised how few will even reach the target. 20 gallons seems like a relatively high herbicide volume per acre, and even with a Coarse droplet size you should be getting excellent coverage. Let’s ask Mike if yours is a common problem. It could be timing, or some form of resistance, which would trump nozzle selection. Weed Specialist: I have included an excerpt from the Problem Weed Book where I summarized common ragweed efficacy with post-emergence soybean herbicides. You will note that over the course of nine trials, there is quite a variation in control of common ragweed with fomesafen (Reflex). 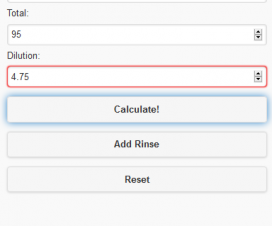 Now – looking at the table above, you might ask yourself “Why wouldn’t I use FirstRate? It seems to be more consistent at controlling ragweed than Reflex.” Yes, but there are a lot of common ragweed populations in Ontario that are resistant to FirstRate. 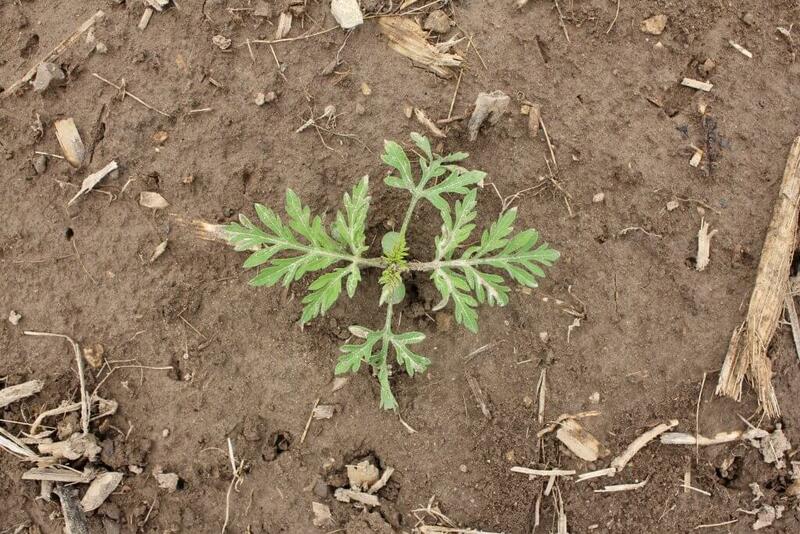 There are no known populations of ragweed in Ontario that are resistant to fomesafen. Globally, there are instances of PPO (Reflex) resistant ragweed populations, so it would be wise to rule that out. In the future I can coordinate the testing of your common ragweed for herbicide resistance. Factor # 1 – Plant staging. We see trouble when applications are made to common ragweed beyond the 6-8 leaf stage of growth. Since fomesafen is a contact herbicide, the more advanced the plant, the more growing points that need to be “burnt off” and the greater likelihood of re-growth from those that were not sufficiently damaged. Typically things look great one week after application, but within two or three the plant has branched out and started to regrow. Factor # 2 – Water volume. If using AI nozzles, increased water volumes (20 gal/ac) have been demonstrated to provide better control of common ragweed with fomesafen than lower water volumes (10 gal/acre). Citation is here. The following graph shows the influence of water volume on control of velvetleaf with fomesafen, the same trend exists with common ragweed. Factor # 3 – Temperature (Time of day). While this has not been proven in the literature, I’ve observed it under field conditions. When applications are made in the heat of the day, control is better than when applications are made in the evening. 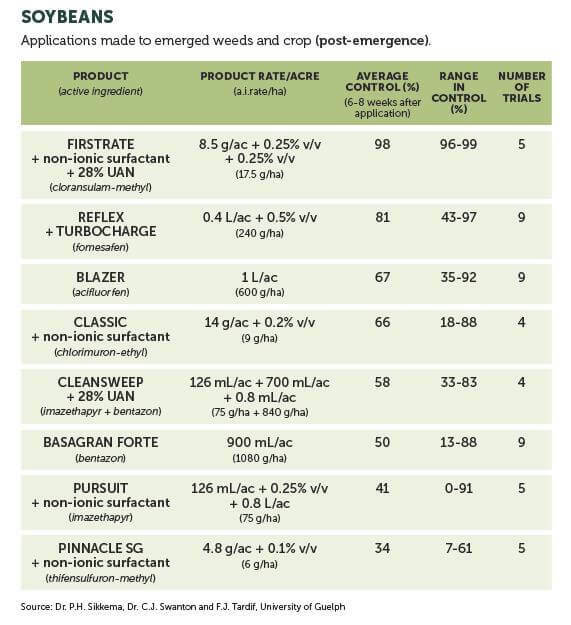 Generally, ambient air temperature and post-emergence weed control are related and the response can be significant with certain weed species and herbicides. I agree that we shouldn’t be using the XR nozzle. I wonder if the agrichemical company recommended it based in part on the citation I provided under Factor # 2, where the authors found that water volume did not influence the Reflex’s control of common ragweed using flat fan nozzles. Fomesafen is about the best active we have for common ragweed in soybeans and edible beans, but it can be very inconsistent. If you have a decent soil applied herbicide down in soybean (e.g. Triactor, Bifecta, Lorox), that will go a long way to lower the population density of common ragweed and make it easier to target (and control) smaller plants with fomesafen. Grower: Thanks for the information. I did not know that fomesafen had such a range in ragweed control. In OMAFRA Publication 75 reflex has the highest rating. A majority of the time I use reflex to control escaped ragweed from the pre emerge program. Our 20 g/ac volume seems to help control, but not enough to get above 90%. I’ll avoid the XR and look to time-of-day to help with control. Weed Specialist: The ratings in Publication 75 are challenging to develop because they are based on ideal conditions, but life rarely is. For example, the maximum labelled stage for common ragweed to be adequately controlled by Reflex is 4-leaf. The ragweed in the following photo is actually pushing the 6-leaf stage. This stage can be difficult to target when ragweed can push out two new leaves every four-five days. Even with glyphosate, the rate of glyphosate needs to be increased 100% to maintain control should the ragweed exceeds 10 cm in height. Rate increase is not an option for Reflex (unless you’re a fan of really brown soybeans). Best of luck with your applications. Ragweed is always the Achilles heel in our IP soybean weed control trials. Mike has been the Weed Specialist in Field Crops for the Ministry of Agriculture, Food and Rural Affairs since 2002. 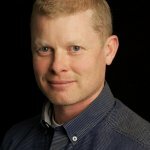 His work focuses on providing tools and resources to help Ontarians manage weeds. He obtained both BSc. (Agr) and MSc. Degrees at the University of Guelph. 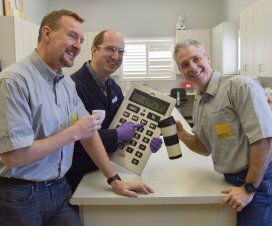 In addition to his role with the Ministry, Mike also has Adjunct Faculty status in the Department of Plant Agriculture at the University of Guelph. He resides on the family farm north west of Guelph with his wife and daughter where they grow corn, soybeans and wheat.